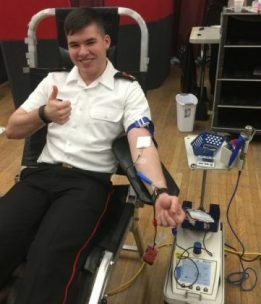 The Canadian Blood Services visits the Royal Military College every few months to collect blood from the cadets and staff. RMC being a military facility is always looking for ways to give back to the community and does so through the Blood Clinics. I recently attended the Clinic this past Friday, where I donated some of my blood. I was happy to see that there was a large turn out of cadets and staff, at the event. Even the Commandant, Brigadier General Sébastien Bouchard made an appearance to donate some of his blood. 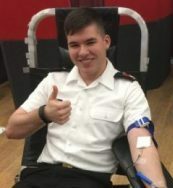 The number of cadets who attended the clinic allows for a surplus of blood donations, where the blood would help make up for other blood clinics that do not receive the same attention. With the large amounts of people at RMC willing to give blood, the blood clinic always makes RMC a desired spot to set up shop. The staff at the clinic were very professional and were great at their job. Some of the nurses had over 10 years of experience working in the service. The nurses were clear in the instruction of how the procedure occurs, from start to finish. Their professionalism, and good manor allows for the process of the blood donation to go off without a hitch. The process is fairly quick, where it takes about half an hour from start to finish. From the start, a questionnaire must be completed to ensure that the blood that you will give does not have anything wrong with it or any disease in it. The next step is to wait for your name to get called to actually donate the blood. Once your name is called, it is into the chair. The process of blood letting it straight forward since the needle goes into one of the larger veins in the arm. The blood letting usually takes about 5-8 minutes in total and takes a total of 500mL of blood. Once the bag is filled, the needle is extracted and you must hold onto some gauze for 5 minutes while the wound heals. After all is set and done, you can relax and enjoy some juice and cookies while you wait out the mandatory period to ensure that you are good to go after the donation. The experience as a whole is very cool, the staff are professional and nice, and it is always a good feeling (mostly a light headed one) to donate blood that could save someone’s life. If you ever have the chance, I strongly encourage anyone to go out and donate blood if you can. Dr. Darrell Menard MD: Tips for those of us overweight folks! Glad to see clinics continue at RMC currently. Started giving blood at RMC in 1973, in first year. At the time one could only donate four times per year, and later at some point to six times a year. There was a period of a dozen years that due to geographical circumstance (not in military), I was not available to donate. In 2012 received a certificate for the gift of ‘One Hundred Donations’. Believe it is a worthwhile habit that helps so many.